The Nintendo Switch is awesome because it lets you enjoy the same great gaming experience at home on the big screen or on the go. Meanwhile, the Super NES Classic Edition console is awesome because it lets you play some of the best SNES games of yesteryear. Wouldn’t it be great if you could combine those two consoles into one? Well now you can. 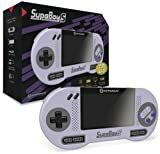 The Hyperkin SupaBoy S Portable Pocket Console works with every SNES cartridge ever released, and it has a color screen built right in so you can play games anywhere. Then when you get back home, you can connect it to your TV and plug in any SNES compatible controllers!